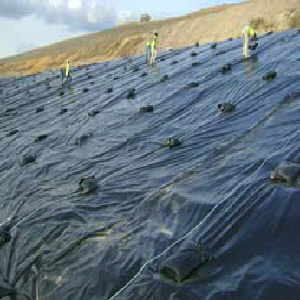 GeoSkrim® K36BT, K40BT and K45BT are unique textured scrim reinforced cast geomembranes manufactured using high strength virgin grade polyethylene resins. GeoSkrim® textured K-Series is reinforced with a dense scrim reinforcement to maximize tear and puncture resistance. Both the single sided and double sided textured K-Series are manufactured utilizing a cast extrusion process to achieve a consistent friction surface with uniform asperity heights. GeoCHEM's GeoGrip™ Technology consists of durable random spikes and bidirectional bars for uniform stabilization and support. GeoSkrim® textured K-Series combines both the exceptional performance characteristics of our smooth K-Series with the integrated GeoGrip™ surface texture providing a highly versatile geomembrane for use in many applications. Click here for Product Data Sheet.